Normally I do not like to post two of the same recipes back to back, like two breakfasts, two snack bars, two desserts, etc. 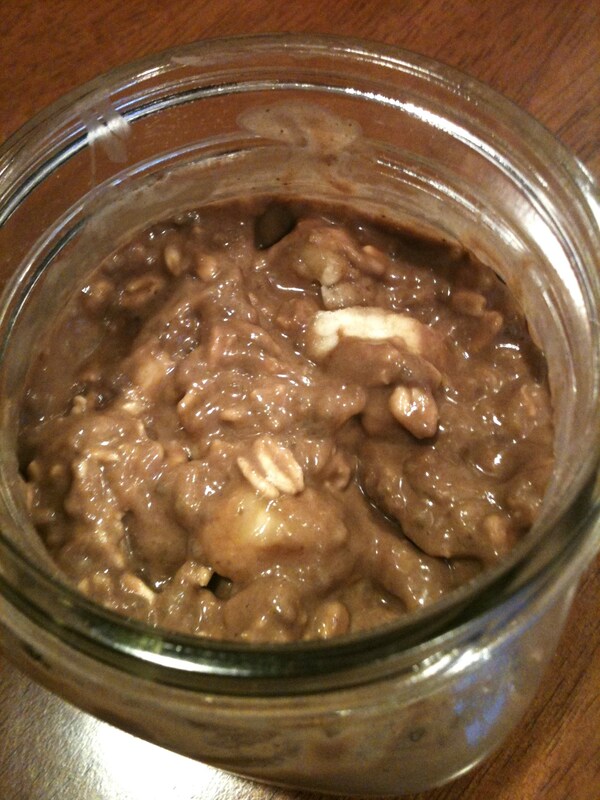 However, today not only am I posting another breakfast recipe, but it is another overnight oats recipe. I have been loving these overnight oats these last few days. I think it is because of the hot, humid mornings after a workout and I come home craving some good fuel and would much rather eat it cold then hot. 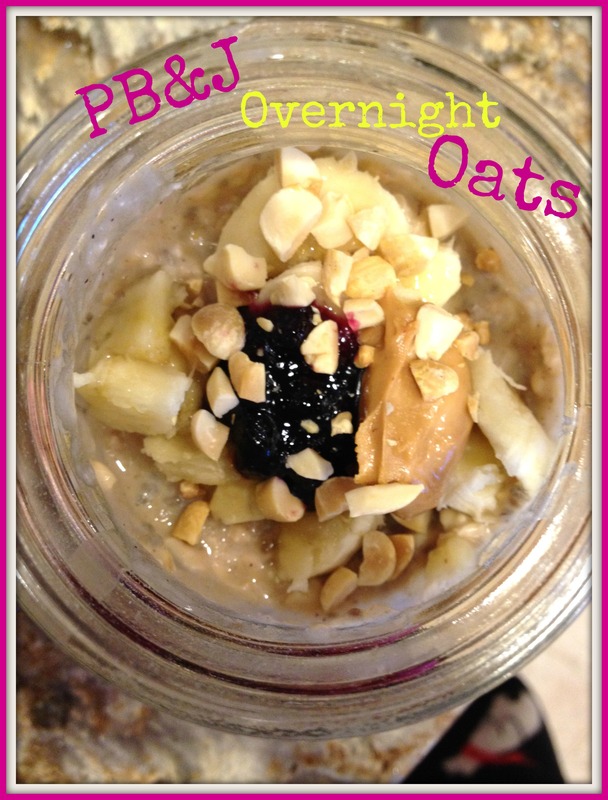 This PB&J Overnight Oats is very similar to yesterdays Chocolate PB Banana Oats. In fact, it pretty much is the exact same recipe. The only thing I changed was instead of using 1 tbsp cocoa powder, I used 1 tbsp strawberry jam! In the morning, stir, top with additional peanut butter and jam (if desired), and enjoy! Or reheat first, then enjoy! *Once again, I mashed half the banana and sliced the other half of the banana to top. 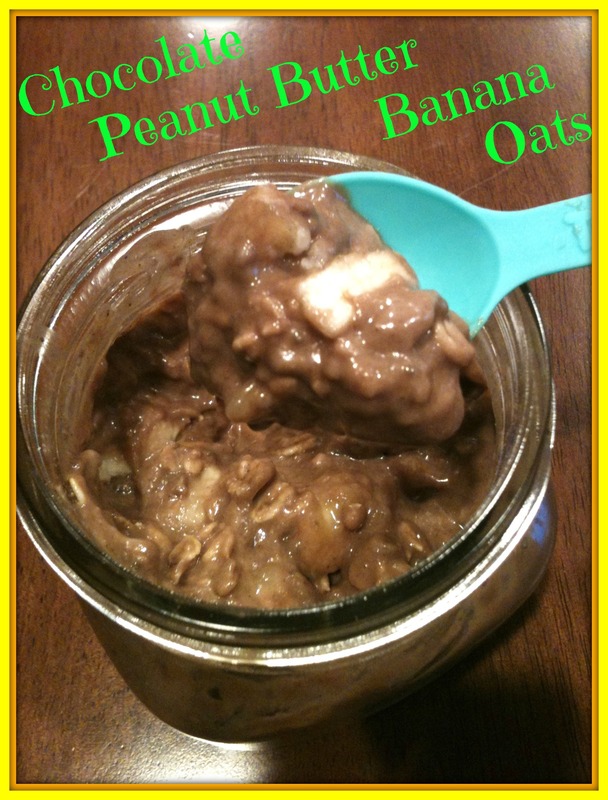 Now I’m interested in combining both recipes…Chocolate PB&J Banana Overnight Oats! I bet that would taste amazing! This recipe yields approximately 390 calories and 11g protein. I haven’t made overnight oats in a while! I decided to prepare some on Wednesday evening and leave them in the fridge until the most convenient time to eat them. Like if I had to go somewhere and needed a breakfast to take with me, needed something quick, didn’t feel like preparing breakfast, or woke up hungry and didn’t want to wait to prepare breakfast. This morning, I was so glad I had these oats ready to eat when I came home from working out. They were a perfect post workout breakfast and perfect since I was hungry and would not have wanted to spend extra time cooking anything! In the morning, stir and enjoy! Or reheat first, then enjoy! *You can mash the whole banana or mash half the banana and cut the other half in slices to top the oats. If you want banana slices, you can add them to the oats after mixing together all the other ingredients or top the oats just before serving. I was in the mood for a cold breakfast so these oats were perfect straight from the fridge! I had these sit in the fridge for 3 days and they still tasted amazing. They were so thick, creamy, and the oats really soaked up all the moisture making this a voluminous breakfast. This recipe yields approximately 365 calories and 11g protein. Here is a pancake recipe that is less cake-like and very dense. Since these pancakes are so dense, they are very filling which would make them a perfect breakfast if you will be busy all morning and won’t have a chance to eat lunch until later in the afternoon or won’t have a chance for a morning snack. Combine 1 tbsp flax with 2 tbsp water and set aside. In a medium bowl, combine almond flour, buckwheat flour, cinnamon, baking soda, sea salt, and shredded coconut and mix to combine. 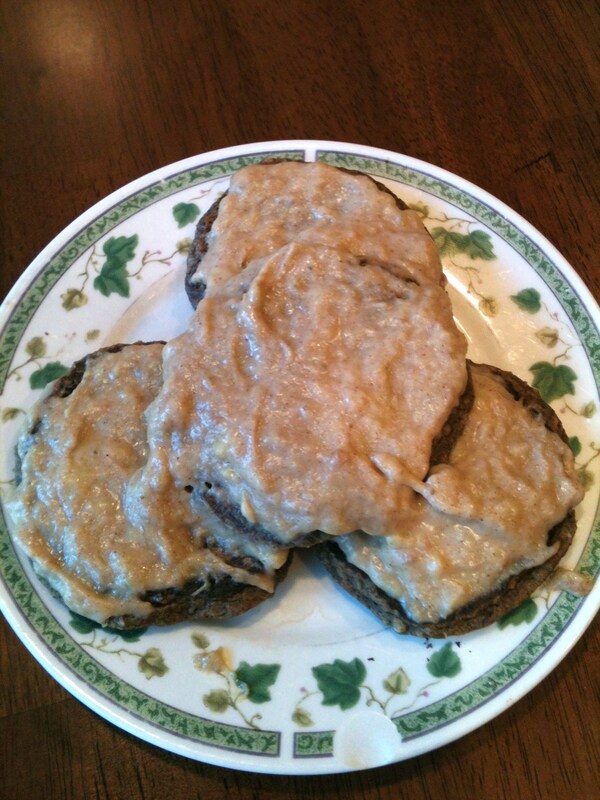 In a small bowl, combine the flax egg with the almond milk, maple syrup, and vanilla and mix to combine. Pour wet ingredients into dry ingredients and stir until incorporated. Spoon pancake batter onto a hot greased pan and cook over medium heat until golden brown on both sides. While the pancakes are cooking, prepare the banana cream. In a microwave safe bowl, mash the banana. Add in the almond butter and almond milk and stir. Microwave for 1 minute, watching carefully so it doesn’t spill over the bowl. Top your pancakes with the banana cream and enjoy! *I ground my own almonds to create almond flour. I do not have a very strong food processor so I had some small almond chunks in the pancakes, which I actually enjoyed, it created great texture. I think that is what made these pancakes so dense. Since the almond flour wasn’t as powdery as real flour, I added 2 tbsp buckwheat flour to help absorb some of the liquid. If you use store bought almond flour, or you have a food processor that blends really well, you can probably omit the buckwheat flour. 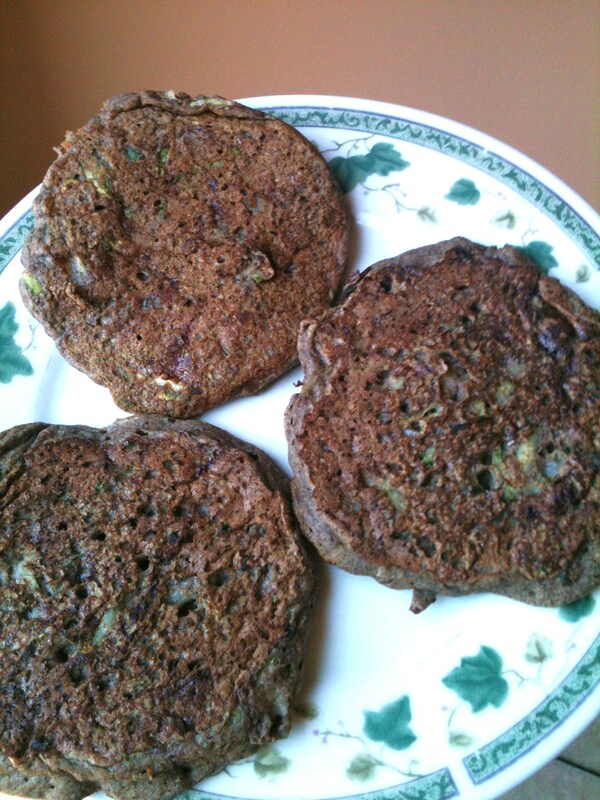 You can also probably turn these pancakes into Buckwheat Coconut Pancakes by using just buckwheat flour and omitting the almond flour. Since buckwheat flour absorbs liquid really well you would probably only need 1/2 cup buckwheat flour, but I would need to experiment with this to see if it works. With this recipe I was able to make 4 medium pancakes. I am roughly estimating that the pancake recipe yields approximately 540 calories and 18g protein and the banana cream recipe yields approximately 160 calories and 4g protein. I haven’t posted an entree in a long time. With all my smoothies, breakfast recipes, and desserts, I swear I am also eating delicious meals. 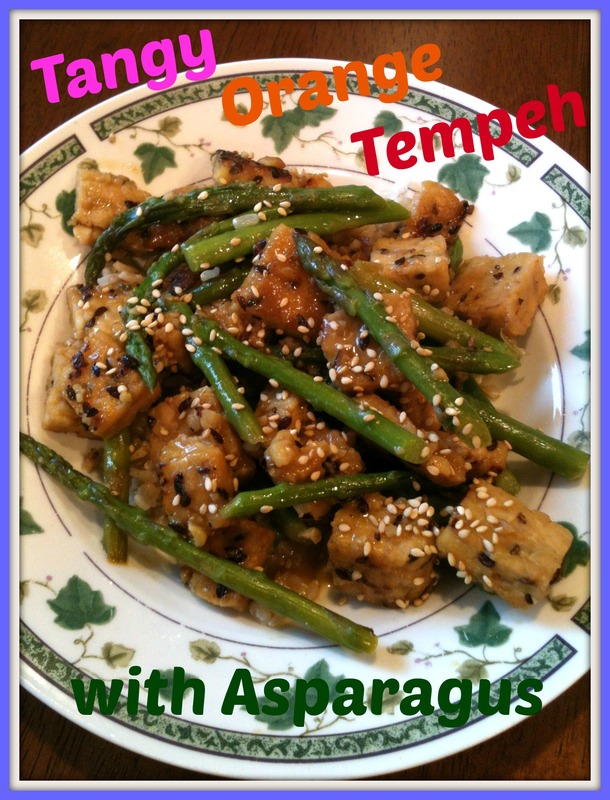 This entree is a great meal as it provides grains, protein, and veggies altogether. It was very simple and quick to prepare and full of flavor. First, prepare the orange glaze by combining orange juice, ginger juice, tamari, mirin, maple syrup, brown sugar, coriander, and garlic in a bowl. Mix together until the sugar dissolves. Set aside. Slice up the tempeh and set aside. Cut and steam the asparagus. Meanwhile, in a medium pan, add olive oil and heat over medium heat. Once hot, add the tempeh. Brown the tempeh on both sides, adding more oil if needed. Stir in 2 cups of the orange glaze. Cook over medium heat until the sauce thickens. Once thick, add the asparagus and stir. Allow to simmer for a few minutes before removing from the heat. Serve over brown rice for a hearty meal. 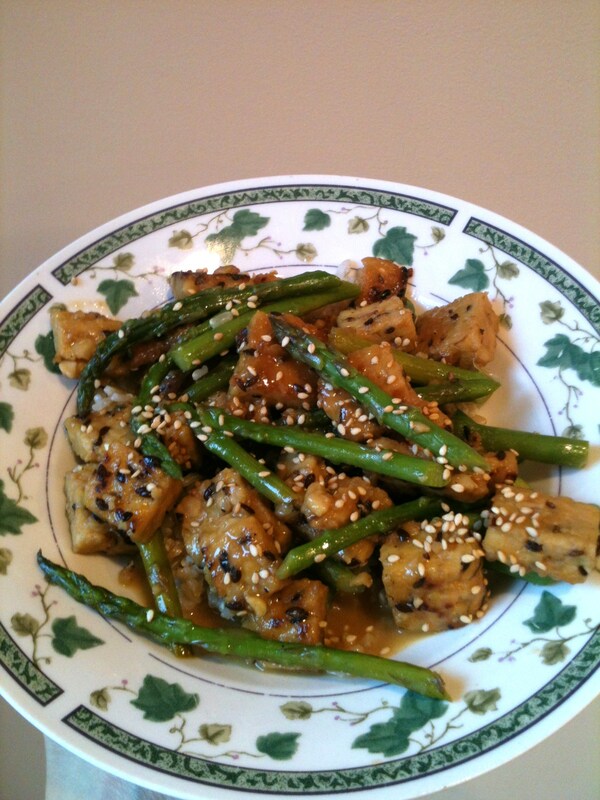 Top with sesame seeds! There are a lot of ingredients for the orange glaze, but it does not take long to measure everything out. The glaze can also be prepared a day before or earlier in the day if needed. The sauce alone makes this recipe worth making; it is full of flavor! You will also have a little extra sauce left, which I just used to flavor some brown rice the next day. Not only have I been making a ton of smoothies lately, but I have also been adding in oats. It gives the smoothie a great texture, makes the smoothie more filling, and gives the smoothie a good nutritional boost with the extra fiber and protein. If you don’t have a high-speed blender it helps to let the oats soak in water for about an hour to soften which makes blending easier. Soaking oats also adds volume, so you feel like your adding more than it may first appear which results in a more filling and satisfying smoothie! Also, if you don’ have a high-speed blender, you probably normally have to peel your apples for a smoother texture. Well this recipe will save you the time of peeling and chopping an apple because instead of using an apple it uses applesauce! If you want a really thick smoothie, make this earlier in the day or even the night before. The oats and chia seeds will really soak up a lot of liquid, you might even want to eat it like ice cream with a spoon! This recipe yields approximately 330 calories and 14g protein. I have not made french toast in a long, long time. Since before I became vegan. When I still used dairy milk, eggs, and butter. 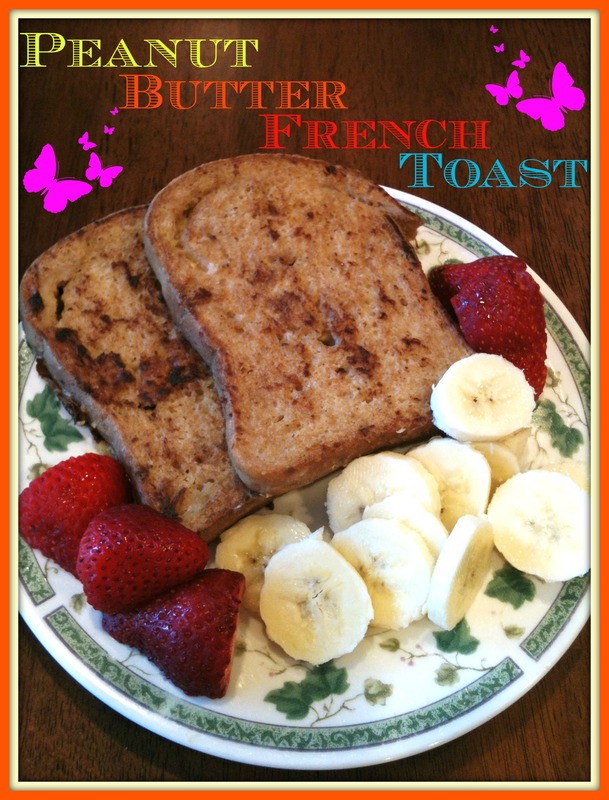 I’ve always seen recipes to make vegan french toast, but I never tried it out until now. 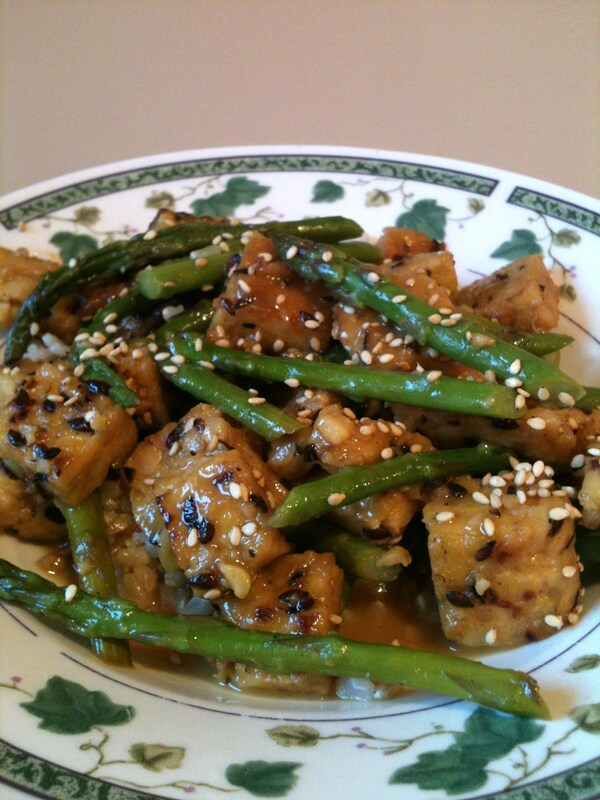 This recipe was simple, delicious, and much healthier than the non-vegan version. Plus, it has tons of protein! Combine all ingredients, except bread, in a shallow bowl. Place a slice of bread in the mixture and coat both sides. Allow to sit for 5 minutes. 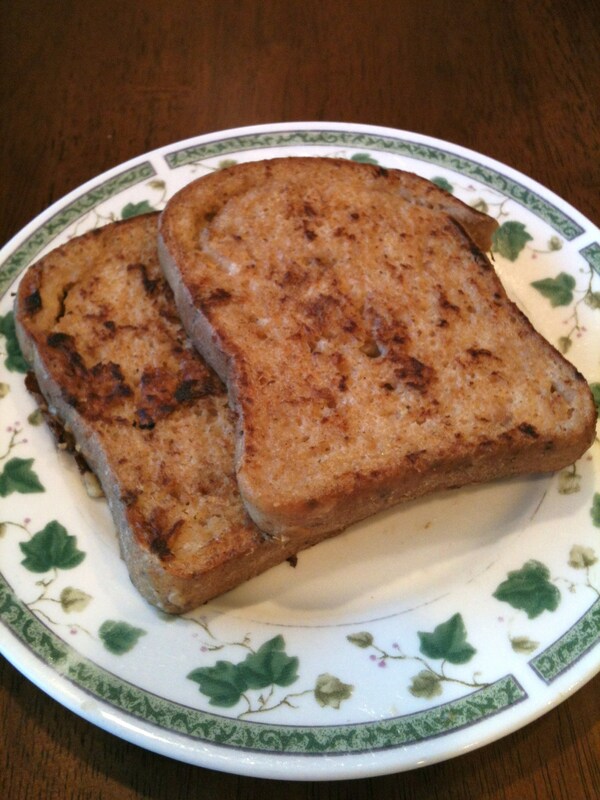 Spray a non-stick pan and over medium heat cook the first slice of bread until golden brown on both sides. While cooking this first slice allow the other slice of bread to sit in the mixture. Cook the other slice of bread over medium heat until golden brown on both sides. For my toppings, I mixed a little maple syrup in with the remaining mixture that was left over, the rest of the banana, and some sliced strawberries! Next time I’m adding peanut butter for extra peanut butter taste! This is a single serve recipe, but can easily be doubled, tripled, or quadrupled for more people or to have leftovers! I have been making LOTS of smoothies lately. With this warm weather, a cool and refreshing smoothie is a perfect afternoon treat. I have also been making smoothies to get extra protein and as an easy way to get my new daily dose of maca. Blueberries and bananas are two fruits that go really well together. Wait, any fruit goes together well! But the blueberry and banana combination is an awesome flavor. Directions: Combine all ingredients in a blender and blend until smooth and creamy! This smoothie could also be increased in nutrition by adding a handful of spinach, though I’m sure the color wouldn’t look the best. But the taste of the smoothie is what’s important! I don’t have a picture of this smoothie because I got a new blender. It is a blue-tinted bottle so you can’t really see the smoothie and I didn’t want to dirty a glass just for a picture of a smoothie, besides the color they all pretty much look the same. Anyways, I absolutely love this blender! You just toss all the ingredients together in the bottle, put the blender cap on, blend, and then switch the blender cap for the drinking cap. It is super easy and no clean up (well, besides the blender cap, which I just put in the dishwasher, and until you have to clean the bottle after drinking the smoothie, which I also put in the dishwasher.) It is perfect for someone who makes smoothies daily or almost every day and likes them to be portable. 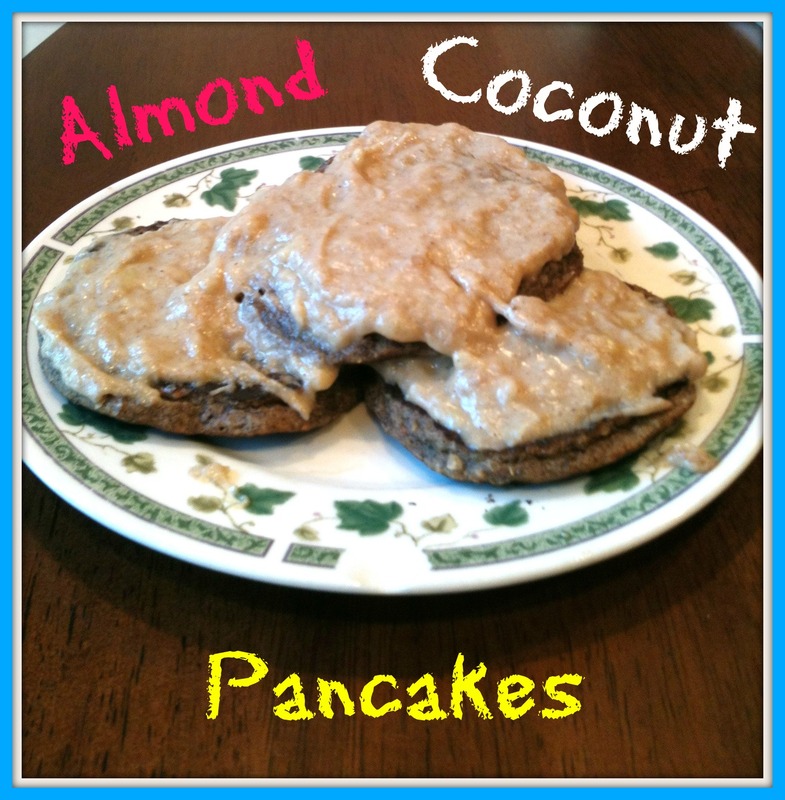 This recipe (with both optional ingredients) yields approximately 250 calories and 11g protein. I am thrilled that it is finally summer vacation! That means I get tons more time for baking and cooking. One thing I am super excited about is being able to spend time on some delicious breakfasts! Throughout the winter and most of the school year, I was eating oatmeal because they were warm and simple to prepare ahead of time. I do love my overnight oatmeal in the summer months, but I think I have had enough oatmeal for a little bit. Now that I have time in the morning, I am planning on going through all my recipes I have pinned or saved for pancakes. I have come across so many good ones, but since I never had a chance to make them, they have been piling up. So you may see lots of pancake recipes on here over the next few weeks. 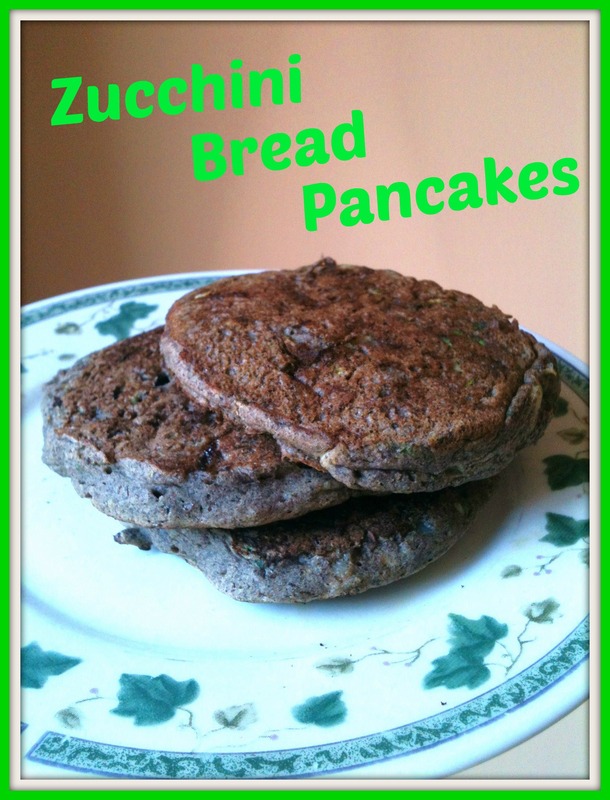 Today’s pancake recipe is Zucchini Bread Pancakes. I was only making these for myself so I cut the original recipe in half. Of course you can always double the recipe for more people, or to save some for quick breakfast leftovers! In a medium bowl, combine buckwheat flour, flaxseed, baking powder, cinnamon, and nutmeg. Stir to combine. Add in almond milk, maple syrup, and diced banana. Gently stir to combine. Gently fold in the zucchini, raisins, and walnuts. 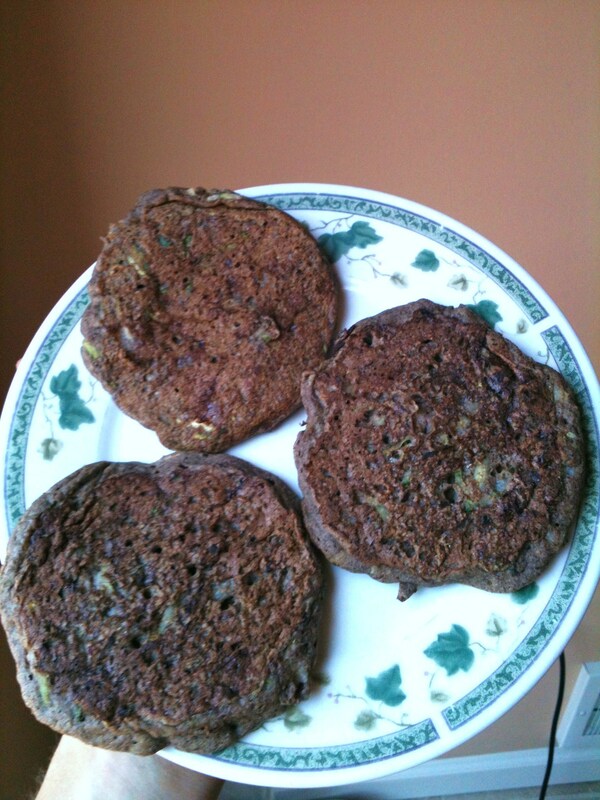 Spoon pancake batter by 1/4 cup onto a hot greased pan and cook over medium-high heat until golden brown on each side. Top pancakes with additional raisins, walnuts, and maple syrup! If you are not a banana person, you can probably completely omit the banana, or reduce it to only using about a 1/4 of the banana. I love bananas so I actually added extra! And I love toppings so I added extra raisins and walnuts to top! This is a perfect breakfast for when you want to sneak in an extra serving a vegetables first thing in the morning – a great way to start your day! For my birthday last Wednesday, June 5th, I decided to try a new pie recipe. 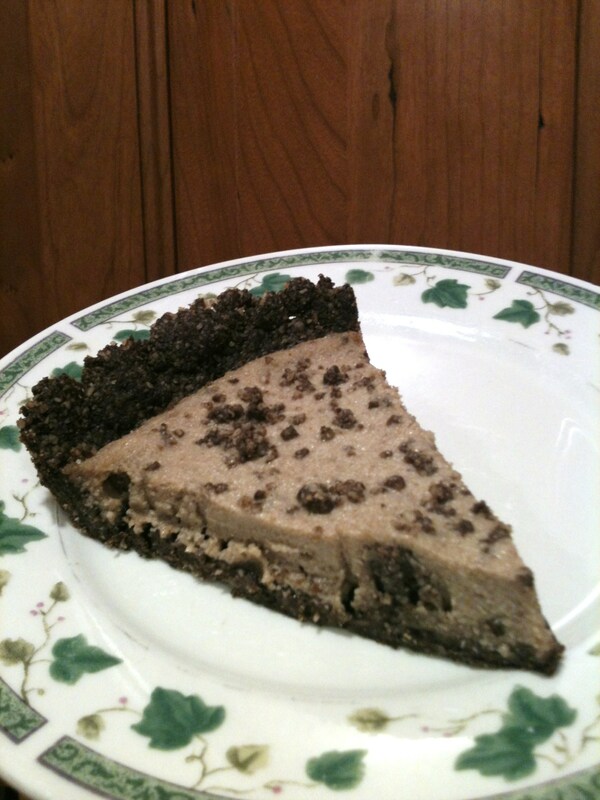 I basically made Chocolate Covered Katie’s Oreo Cookie pie. I didn’t have a chance to get to the store to buy gluten free oreos, so I just used 6 chocolate chip and double chocolate cookies I had in the pantry. It was very tasty and especially with this crust I made. 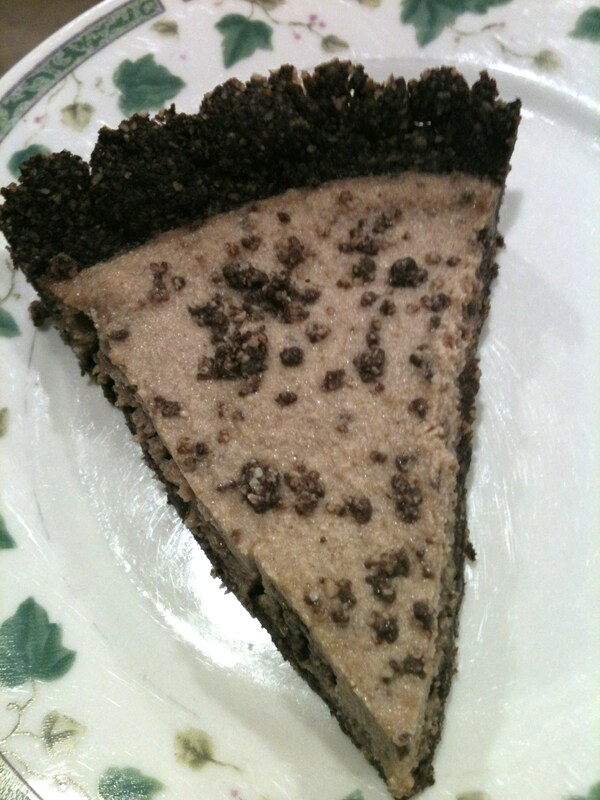 The chocolate and coconut flavors went great with the cashew cookie pie! Preheat oven to 325F and grease a pie pan with non-stick spray. In a food processor, grind almonds into a powder. Add rolled oats and cocoa powder and blend until broken down. Add dates and coconut oil and continue to blend until everything is mixed together. Transfer crust to the prepared pie pan. Press crust down evenly and firmly along the bottom and sides to create crust. Bake for 15 minutes. Allow to cool before filling with your favorite pie recipe. You might have extra crust. I probably had enough to make a whole other pie. If you want you can half the recipe above or do what I did and save the extra “crust” as a crumbly topping for yogurt bowls! I love chocolate and coconut flavors together! Also, this crust is very crumbly and I found it is best with a no-bake pie. Since the pie recipe I used stays in the fridge, it helped the crust stay firm when eaten.